Upgraded version of the well-known ALL-300 series leak detector. The ALL-300 Pro Series Automotive Diagnostic Leak Detector is designed for test leaks in vehicle pipe systems. It could be used on all cars, motorcycles, snowmobiles, ATV, light trucks, boats, etc. EVAP Model also applicable on EVAP system, but NOT suitable for Turbo system. 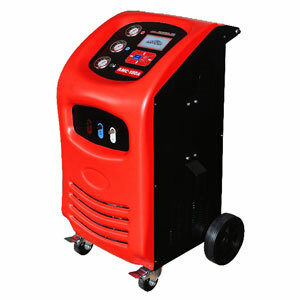 EVAP/Turbo Model is with internal air compressor, while EVAP/Turbo Ext. will need shop air supply with air pressure recommended at less than 8bar/90psi. Mount the Power Cords to the Power Inlets(A). Note: Red plug to red socket and black plug to black socket. Mount the Smoke Tube to the Smoke Outlet(B) , and lock it with the quick clamp. or rest them on the Rack(E). Note: Use the Velcro Strap( D) or the Rack(E) to collect the Power Cords and the Smoke Tube before storage. Open the Oil Filler Port(F),fill smoke oil into the reservoir, note the Oil Level Indication Window(K), make sure the oil level do NOT exceed the Max line(middle of the window). If the smoke oil is overfilled, turn the unit upside down to drain some oil out. Now the unit is ready to use. Note: Pay attention to the Oil Level Indication Window(K) before use. If the oil level is close to the bottom, the unit will need a refill. For EVAP/TURBO Ext. models, mount the Shop Air Connector to the Shop Air Inlet Port(C), the unit will start generating air pressure. For EVAP/TURBO models, connect 12V vehicle battery with the clamps on the Power Cords. The Power status LED (G) will be ON and the unit will start generating air pressure. Note: red clamp to positive(+), and black clamp to negative(-). Turn the Flow Dial(H) to max, the Flow Gauge(I) will indicate the flow rate. Block off the smoke nozzle on the Smoke Tube with finger tip, the Pressure Gauge(J) will indicate the real time output pressure. Note: If the pressure is out of range, take off the cover at the Pressure Adjustment Port(L), then use a cross screwdriver to adjust the output pressure. Note: If the pressure is out of range, take off the cover at the Pressure Adjustment Port(M), then use a cross screwdriver to adjust the output pressure. Select Smoke Mode(G) and press Start Button(G), the Operation Status LED (G) will be ON. 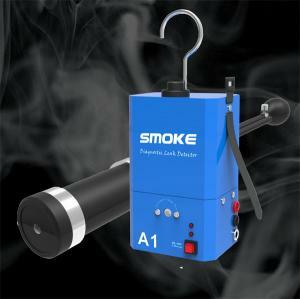 The unit will start producing smoke and stop automatically when a 5 minutes’ working cycle is finished. Or press the Stop button(G) anytime to stop the unit manually. Turn OFF the ignition of the vehicle. LEAK TEST OF VEHICLE SYSTEMS REQUIRE THE ENGINE TO BE OFF. Unmount the Air Filter, and the Throttle connections. Clean the opening and avoid sharp objects before put the adaptor in. Put the Intake Adaptor Cone(or the Universal Intake Adaptor) into the opening. Connect Power Cords to 12V vehicle battery. For best performance, the vehicle battery shall be fully charged. Do NOT use a DC12V switch power supply. Now the unit shall generates pressurized air flow. Turn the Flow Dial to max, then introduce the smoke nozzle into the system via the Intake Adaptor Cone(or the Universal Intake Adaptor). Wait for 30 seconds for the system to pressurized. Observe the Flow Meter and the Pressure Gauge for leak status. 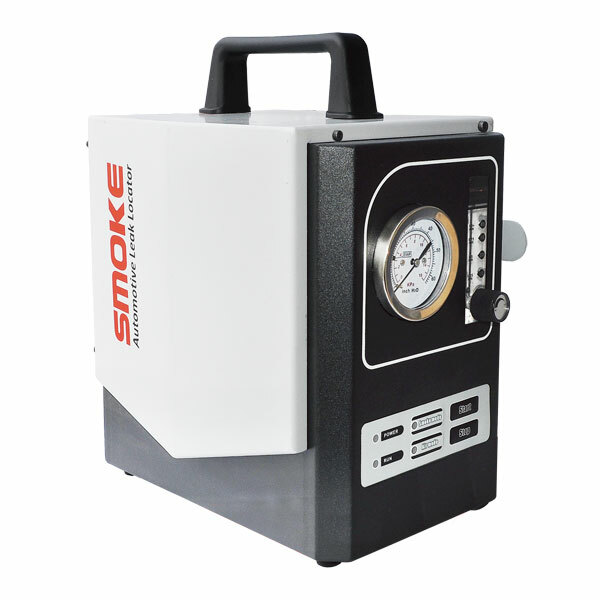 If there’s leak in the system, select the Smoke Mode then press the Start Button, the unit will start generating smoke for an auto-stop 5 minutes working cycle. Pull off the smoke nozzle, and plug it back again when there’s obvious smoke coming out of the smoke nozzle. The system will be ready for leak check in 2 minutes. Use a bright light torch or working lamp to assist. After leak test, collect the Power Cords and Smoke Tube with the Velcro Strap or the Rack, clean the Intake Adaptor Cone(or the Universal Intake Adaptor) before storage. Cap Stoppers could be used to block off various opening, if test on partial of the whole system is required. Cap Stoppers also could be used to block off the intake, and smoke nozzle connect to the system via other opening available. Smoke method can NOT be used on testing leak of oil-sensitive parts, eg. lamp housing. 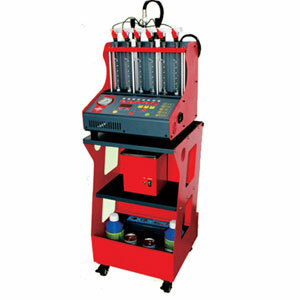 ONLY 12V vehicle battery are allowed to be used as power supply for the machine. Remove the Schrader Valve, by using the Schrader Value Tool. Note: The valve is left-hand thread. Mount the EVAP Service Port Adaptor. 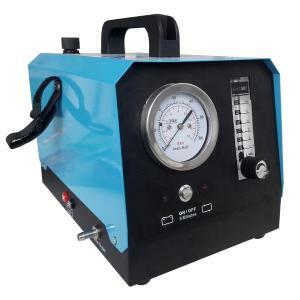 Connect the smoke nozzle to the EVAP Service Port Adaptor, introduce pressurized air into the system, turn the Flow Dial to max, check the status of Pressure Gauge and Flow Meter to confirm if there is a leak. If there’s leak in the system, press the Start/Stop Button, the unit will start generating smoke for an auto-stop 5 minutes working cycle. In 2 minutes, the system will be ready for leak check. Use a bright light torch or working lamp to assist. This parts comes with TURBO models ONLY. Clean the inner wall of the intake opening while the Air Filter, and the Throttle connections are removed, so as not to scratch the adapter. Close the Pressure Relief Valve(A) next to the Hand Pump(B). Put the Rubber Component(C) into the intake opening. 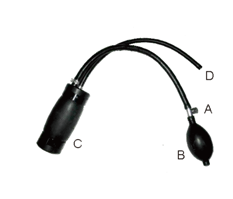 Inflate the Rubber Component(C) by pressing the Hand Pump(B) till the intake opening is tightly sealed. Now the system is ready to test, introduce air/smoke into the system by plug the smoke nozzle into the Tube Opening(D) . After test, pull off the smoke nozzle, release the inflated air by open the Pressure Release Valve(A) next to the Hand Pump(B). Clean the adapter for storage, avoid contact with corrosive liquids. J&L Techno recommend and will supply our own formula together with the product, but the oil may not come together with the shipment due to custom/carrier companies regulations. Instead, the alternative is to use Paraffin Wax/Baby Oil/Mineral as smoke oil, available in most supermarket or pharmacy. Overfill: Turn the unit upside down to drain some oil out.